KUALA LUMPUR (Reuters) – Malaysian prosecutors on Wednesday filed new graft charges against former prime minister Najib Razak and the former chief executive of scandal-linked state fund 1MDB, in the latest cases over alleged theft of billions of dollars from the fund. Anti-graft investigators this week questioned Najib and the former fund official over accusations that the former premier’s office had tampered with a 2016 government audit into the fund, 1Malaysia Development Berhad (1MDB). The audit was commissioned amid reports of skyrocketing debt and financial mismanagement at the fund, founded by Najib in 2009. Najib had “secured protection from disciplinary, civil or criminal action related to 1MDB” by directing for the audit report to be amended before it was finalised, according to a prosecutors’ charge-sheet read to him in court. 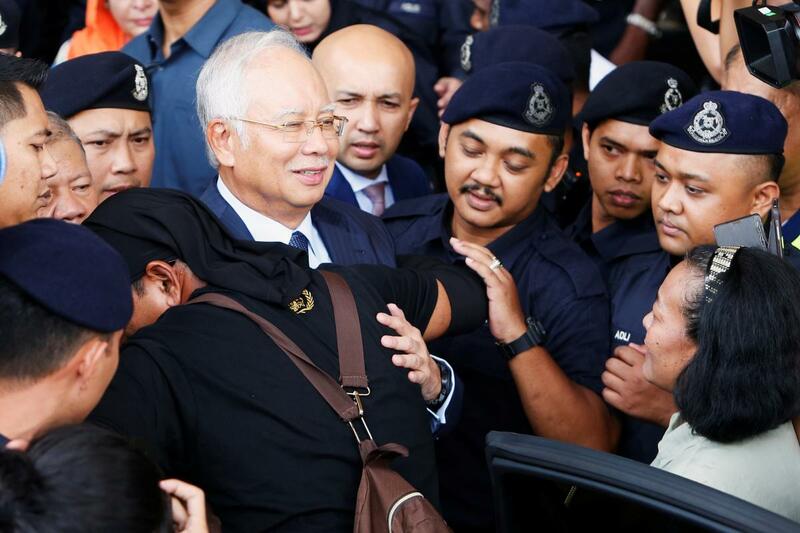 Najib pleaded not guilty to a charge of abusing his position as prime minister, a conviction on which carries a jail term of up to 20 years, or a fine of 10,000 ringgit ($2,402), or both. The fund’s former chief executive, Arul Kanda Kandasamy, pleaded not guilty to abetting Najib. Najib’s lawyer, Muhammad Shafee Abdullah, said his client could not have tampered with the audit, as he was only accused of having directed changes to a draft of the report, rather than the final version. “In this charge, it’s quite clear that it is no longer the allegation…that he had in fact tampered with the audit report,” Muhammad Shafee told reporters. Malaysian officials had said the audit report changes Najib ordered had included removing a mention of the presence of financier Low Taek Jho at a 1MDB board meeting. Low, who is at large and has previously denied wrongdoing, has been charged by both Malaysian and U.S. authorities, who describe him as a central player in the alleged theft of about $4.5 billion dollars from 1MDB. Civil lawsuits filed by the United States say billions of dollars were diverted from 1MDB by high-level officials of the fund and their associates, and that about $1 billion made its way into Najib’s personal bank accounts. Najib, who was ousted in May by a coalition led by Prime Minister Mahathir Mohamad, faces 38 charges of money laundering, graft and breach of trust, most of them linked to 1MDB. He has denied wrongdoing and his trial is due to begin next year. Najib’s wife Rosmah Mansor, his deputy Ahmad Zahid Hamidi and other officials of his administration have also been charged with corruption. All have pleaded not guilty.